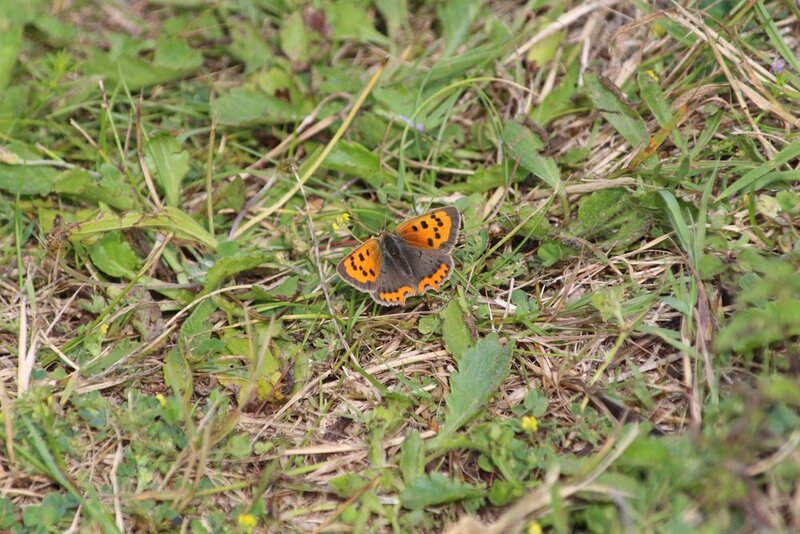 A few weeks ago David Attenborough suggested we take 15 minutes out of our busy lives to sit in the garden/park/countryside and count how many butterflies we could see and if possible identify. What a nice idea, I thought, and what a pleasant way to relax after the busy month and a half of garden openings. So one fine morning, when the sun was shining, the birds singing and butterflies flitting hither and thither I popped into the garden via a buddleia bush at the top of the steps. Ah-ha…three Red Admirals and a Peacock immediately. This is going to be a doddle. But no. Once I’d gone beyond into the land of wild marjoram, carrot and basil, knapweed, viper’s bugloss, field scabious and so on the whole venture took a different turn. Not only were there dozens of butterflies dashing from one plant to another, but some were large and others tiny, and they wouldn’t stay still for an instant. And none were recognisable to anyone but a hawk-eyed lepidopterist. So what to do? Time for my trusty camera: set the ISO to 1600, select continuous shooting (5 shots per second) and auto focus, and hope to shoot a butterfly with wings open. That did the trick but another problem immediately presented itself: hunting the butterflies down and taking their pictures then became obsessional. Whenever the sun shone I was out there snapping away, chasing what I hoped would be a new species usually to find later it was one I’d already got plenty of pictures of. And finally of course I needed to identify everything which meant ordering a couple of books from Amazon, waiting for them to arrive and then trying to distinguish, for example, a Gatekeeper from a Meadow Brown or the undersides of a male Common Blue from an Adonis Blue. Not easy and extremely time-consuming. Wall Brown male, Marbled White, Dark Green Fritillary. To make matters worse still I found I became even more obsessional. I began chasing pictures of anything that moved: dragonflies and damselflies, bumble bees and wasps, even hanging around for ages for a wonderful luminescent green beetle-y thing to reappear on a wild carrot (it never did). l-r: Six Spot Burnet, Hummingbird Hawk-Moth, Dragon Fly. So thank you Sir David, for inveigling me to waste so much time. On balance I think I prefer weeding. Newer PostNews Flash: the green luminescent beetle-y thing.